The first step for me, because I wasn’t buying my crabmeat, was picking all the leftover crabs. I stood over my sink for over two hours picking nearly two dozen crabs clean. I ended up with almost two full pounds of crab meat by the time I was finished and a ton of cuts on my hands and fingers from the shells. If you’ve ever picked a crab, you know what I’m talking about. As tedious as picking crab meat can be, I still find it amazingly relaxing. Maybe it’s a Baltimore thing. If I had to rank crab dishes in an order of favorites, I’d have to say number one is steamed crabs, number two is a a *good* crabcake (which I am super picky about), and then you have Maryland Crab Soup. I am willing to admit I’m a snob when it comes to crabcakes. The good ones are going to almost always be expensive in comparison to the other foods on the menus because they will be made with jumbo lump crab meat. And I refuse to order a crab cake at a restaurant unless I know what I’m getting. Anytime we go to a seafood restaurant in Baltimore, someone will almost always order a crabcake. If it comes out and I find myself envious of their meal and jealous that I didn’t order it instead of my meal, then I know that my next trip there I will be ordering a crabcake. Few places make crabcakes that good. Almost all crab meat, with minimal fillers and breadcrumbs mixed in. And heaven forbid I get one little bit of shell in my crabcake. Something about biting into something smooth and luxe like crabmeat, only to be greeted with a chalky crunch of shell or cartilege between my teeth all but kills my appetite for the rest of the crabcake. Some places are a lot more careful than others about picking through their crabmeat before using it. The first recipe I want to share is one of Maryland’s staples. Regardless of my snobbiness towards crabcakes, one thing I always order, pretty much regarless of location, is a cup of Maryland Crab Soup. It’s light and delicious and the soup highlights the sweet flavor of the crabmeat without overpowering it. I found this recipe off of the website of one of my favorite restaurants back home, Cantlers. The recipe seemed almost too easy to be true, but the taste was spot-on. I felt like I was dockside on the Chesapeake Bay. 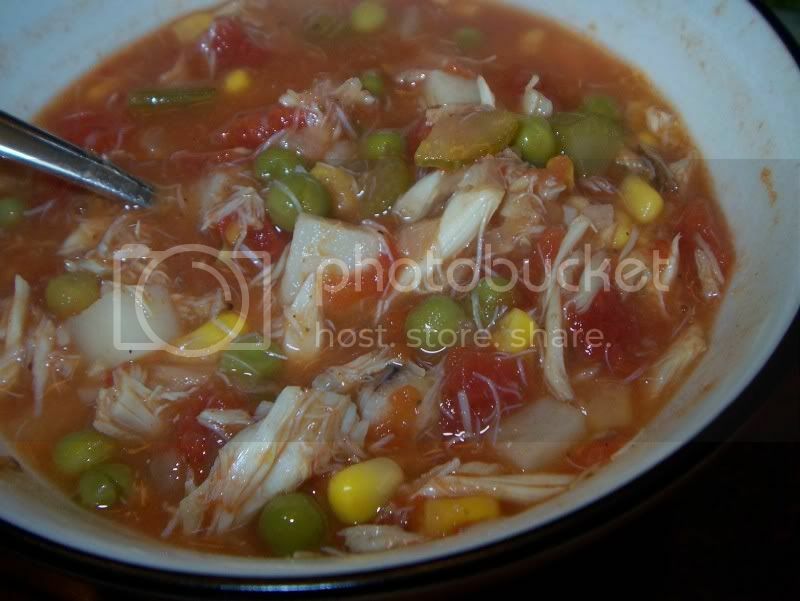 Crab soup is also the perfect vehicle for your less expensive crab meats – claw meat and lump crab. If you’re willing to splurge on the crabmeat, or happen to have leftover crabs from your last feast, give this a try, you won’t be sorry. But please, please, do not use the imitation crab meat. This is one of the few times that only the real deal will do. Place broth in a 6 quart soup pot and bring to simmer. Add vegetables and seasonings and simmer, covered, over medium-low heat for about 45 minutes, or until vegetables are almost done.